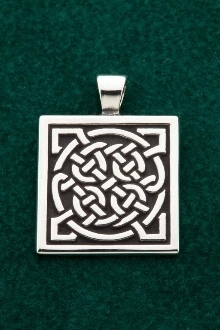 The Circle of life design is an extremely classic celtic knot form, symbolizing the pathway we leading back from the 4 corners of our jouney ultimately back to the source where we may discover our soul. Timeless and traditional, the circle of life will stand as a symbolic testament to the longevity, purity and simplicity of Celtic knotwork as a component of Celtic Art among all the great cultures through history. This pendant is hearty with heavy contrast at over 1" square, and is built for folks liking bolder and heavier traditional designs. Goes well on medium to heavier weight chains, like the box chain series we offer.